Deception Pass Bridge is the common name for two, two-lane bridges on Washington State Route 20 connecting Whidbey Island to Fidalgo Island in the U.S. state of Washington. It was a Washington State Highways project, and included project elements built by young workers from the Civilian Conservation Corps. Completion of the bridge was a factor in the decision to build Naval Air Station Whidbey Island and helped Oak Harbor flourish. The bridge is a commonly photographed landmark of the Puget Sound region. Deception Pass Bridge, connecting Whidbey Island to Pass Island. In the spring of 1792, Joseph Whidbey, master of HMS Discovery and Captain Vancouver's chief navigator proved that it was not really a small bay as charted by the Spaniards (hence the name "Deception"), but a deep and turbulent channel that connects the Strait of Juan de Fuca with the Saratoga Passage, which separates the mainland from what they believed was a peninsula (actually Fidalgo Island and Whidbey Island). Thomas Coupe, a sea captain and founder of Coupeville, was the only man ever to sail a full-rigged ship through the strait discovered by Whidbey. In the early years of the 20th century, travelers of the horse-and-buggy era used an unscheduled ferry to cross from Fidalgo Island to Whidbey Island. To call the ferry, they banged a saw with a mallet and then sat back to wait. 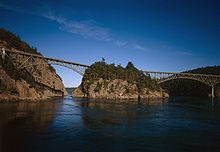 The bridge, one of the scenic wonders of the Pacific Northwest, is actually two spans, one over Canoe Pass to the north, and another over Deception Pass to the south. Pass Island lies between the two bridges. Construction began in August 1934, and the completed bridge was dedicated at noon on July 31, 1935. The Wallace Bridge and Structural Co. of Seattle, Washington provided 460 tons of steel for the 511-foot (156 m) Canoe Pass arch and 1130 tons for the 976-foot (297 m) Deception Pass span. The cost of the New Deal-era construction was $482,000, made possible through the Public Works Administration and county funds. In 1982, the bridge was listed in the National Register of Historic Places. It cost more to paint the spans in 1983 than to build them in 1935. They were painted again in 1997.